We welcome youngsters from Monday to Friday, during the day. This type of hosting allows our youngsters to remain in their family and at the same time, enjoy spending time with their friends at Anta Akhi. because "You are my brother". Georges loves music and dance... and he loves to tell stories! 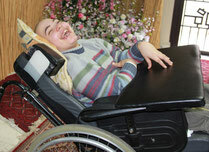 Elie can't hear or communicate by words; still his smile compensates to express all the love inside him to everyone he meets. Thanks to Joanna, her sister comes in on Sunday masses to play music with her choir. He's so discrete, and with a big sense of humor! He also likes to tease Paul... and give him a big hug afterwards! Adla is like a mother to her friends; she is always present to their needs, and is proud to do so! With her charming smile, Rita is always attentive to the needs of each and everyone! Lara can't express herself in words. She appreciates music, animation and outings! When he's given a responsibility he can handle, he does it so proudly! She loves to sing with her large voice... even though she says she's shy! 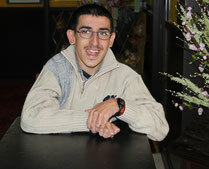 He's so calm and soft; Fadi is always smiling and happy to live! Elie is always happy when he discusses matters with friends. He can't see, move, sit or talk, and he must be fed gastrically. Still, he makes large noises with a big smile to express his joy in being around with friends. Paul is such a pleasant person, always smiling... He's ready to sing when asked for!